Although I have seen my fair share of cakes being made, until quite recently I had never assembled a fondant cake myself. Sure I’ve made cakes of many shapes and sizes with all sorts of types of cakes and fillings, but these were generally cream covered. The few fondant cakes I have seen assembled have been covered by master crafter pastry Chefs. Envious of how easily they molded the sugary fondant dough into shapes and over cakes, I decided to try it out for myself for a friends birthday. 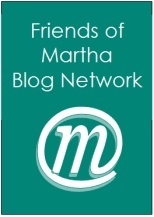 First came the decision for the design. 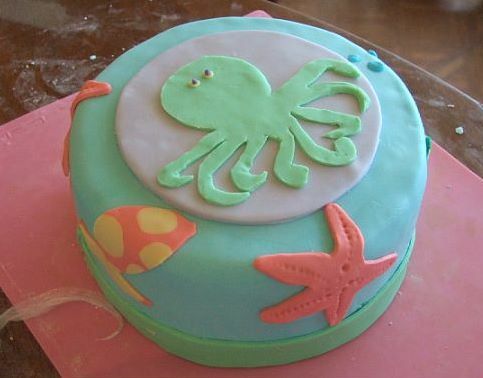 An aqua party calls for an aqua cake and my friend’s favorite underwater animal is the octopus, so I decided on a round cake topped with an octopus and sea creatures on the sides. Miss Katzie, my pastry partner in crime, lent her own limited experience with the fondant cakes to my first try and we were off. First we tackled the frosting. Coating the cake in a thin, smooth layer of butter cream is important as this will allow your fondant to lay smoothly on top of the cake. 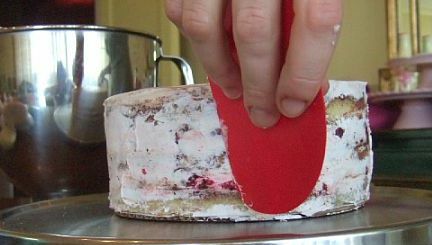 Using a flat plastic bench scraper works well to smooth and flatten the butter cream in order to create a clean and uniform coat. 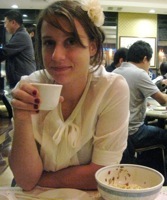 This also can be easier to manipulate if the cream is slightly firm. Once the butter cream coast was properly applied and the cake was returned to to the refrigerator we tackled the fondant. 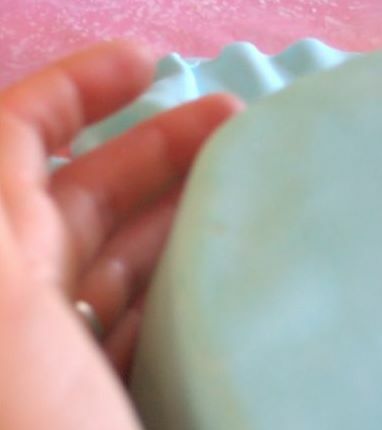 Adding a small amount of gel color to a white piece, we slowly kneaded the fondant and folded it over itself until the color was completely combined into the mass.Then we continued until all fondant was dyed. 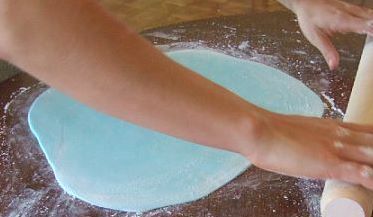 Using a lightly powder sugar dusted sil pat, we rolled the fondant out evenly, making sure not to roll it too thin. 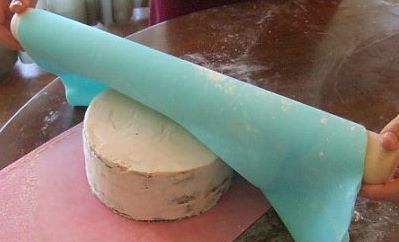 Then we rolled the fondant onto the rolling pin and then slowly laid it from one end of the cake to another. Next was the trickiest part: smoothing out the fondant. Using the heel of our hands we slowly smoothed the top of the cake using a soft rotating motion. Then carefully, with the bottom of our palm we worked from top to bottom to smooth the fondant down along the sides of the cake. This certainly was not as easy as those chef’s make it look. 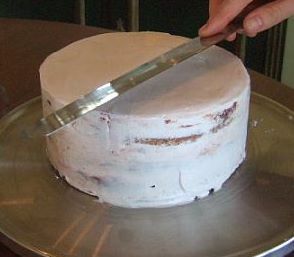 Once the cake was covered, I carefully trimmed the extra fondant with sharp scissors, leaving a1/2 inch border. Then using a sharp exacto knife, I carefully trimmed along the edges. With a few minor mistakes, it certainly wasn’t perfect, but was a good try for a first shot. Once the cake was covered it was time for decorations. Using a large circle cutter, I made a purple plaque for the top of the cake. Then came the octopus, which was no easy task. 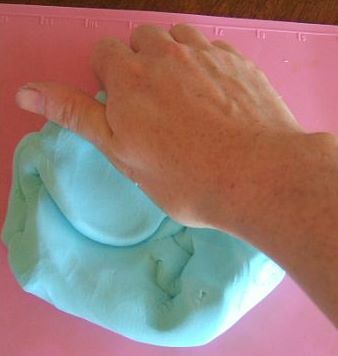 All along fondant had seemed so play dough like, but now it was wet or dry when I didn’t want it to be and hard to cut and manipulate. 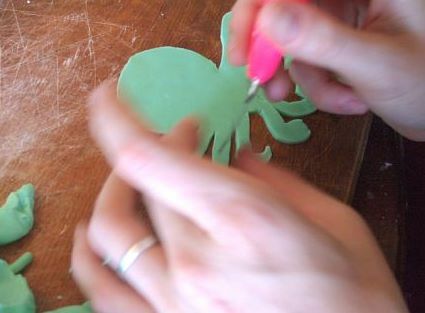 Using a stencil, I tried several times to cut out an octopus shape until I was happy with the results. A few white rolled balls for eyes and the top of our aquatic cake was done. The sides continued the underwater theme. 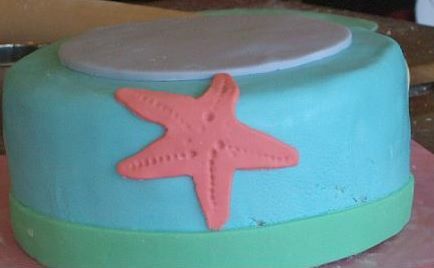 Using a star cutter, Miss Katzie made star fish that were indented with a sea shell to give a more realistic look. Green fondant was cut into spiny trees for underwater sea weed. A few yellow balls were pushed into purple fondant and rolled out to make a polka dotted fish, and a crab cutter was used to create the finishing touch. The cake was fairly moist and were merely laid the decorations around the sides of the cake, trying to cover any tears or holes we initially made covering the cake. Although it could have become the kind of project we just kept adding things to, pinching and prodding at the fondant, we found the line when we had to stop. In the end I was quite happy with my first try at fondant and will certainly tackle the sugary substance again. Covering the cake was definitely the hardest part, so practicing on smaller cakes or even plastic wrapped Styrofoam may help. And my decorations were fairly simple. The harder the decorations become, the more difficult the challenge, and next time I will definitely put myself to the challenge. Once is not enough for a cake ala fondant.